Mo lives in Lao Chai village not far from Sapa. She is 26 years old, married and has three children. Her family lives from farming, she is the only one that works as a tour guide and sells handicrafts to support the family. 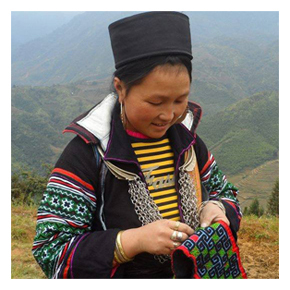 Mo guides trekking tours since 2008, she is very skilled in the art of traditional clothes making and loves to share her knowledge in cooking Hmong food. With plenty of energy and enthusiasm Mo ensures her clients are happy and satisfied. She knows the local customs and traditions of the different tribes and villages in the region. Long treks are her favorite and she will show you the most beautiful places in the area.